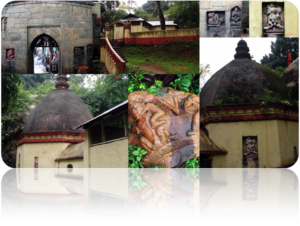 Tukeswar temple is situated about 400 meters west of the Kamakhya temple. There is a gate on the back (west) side of the temple which leads to houses and cement roads leading to this unknown temple. There was no priest and temple was closed. It looks one of those old temples of 15th-16th CE reconstructed by Ahom Kings. Surrounding is deep jungle.. It is opened once a day and puja is performed regularly.